Scotland's health secretary has quit as Nicola Sturgeon unveiled a major reshuffle of her Scottish government cabinet. There are five new cabinet secretaries in the first minister's expanded top team, which remains gender balanced. Shona Robison handed in her resignation as health secretary ahead of the reshuffle being announced. She will be replaced by Jeane Freeman, with Keith Brown and Angela Constance also quitting the government. Ms Sturgeon said the "fresh talent" being brought into her government would help "meet the challenges and opportunities facing the country in the months ahead". Among the other changes are Mike Russell rejoining the cabinet as constitutional relations secretary and Humza Yousaf taking on the justice brief after swapping jobs with Michael Matheson who is now transport secretary. Derek Mackay's finance portfolio has been expanded, but John Swinney remains education secretary, while Fergus Ewing, Fiona Hyslop and Roseanna Cunningham have retained their jobs in rural affairs, culture and the economy respectively. 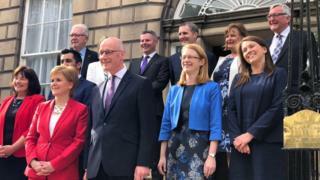 The cabinet team, which has expanded from 10 to 12, is rounded out by Shirley-Anne Somerville as social security secretary - a newly elevated post - and Aileen Campbell as communities and local government secretary. Opposition parties had been calling for Ms Robison's head after a series of controversies in the health services. Her resignation letter to Ms Sturgeon said she had faced a "particularly challenging" year, including the loss of both her parents, a health scare and "some big changes in my personal life". The first minister replied that she would "continue to seek [Ms Robison's] counsel as a colleague and a friend". Ms Sturgeon's core team of cabinet secretaries had been unchanged since the last Holyrood election in May 2016, although there had been junior ministerial changes with Mark McDonald's resignation in November 2017. This is the most extensive reshuffle since Nicola Sturgeon replaced Alex Salmond as first minister in 2014. At least six ministers are out - including three of cabinet rank. The most widely anticipated departure was that of health secretary, Shona Robison. She's been under considerable pressure over NHS performance. She stood down on the day the Scottish government confirmed its worst cancer waiting times for six years. As a close friend of Nicola Sturgeon, she might have been expected to be given a new role in government. But in her resignation letter, Ms Robison said she wanted to "focus on those closest to me" after a series of challenges in her personal life. The economy secretary, Keith Brown, leaves government to concentrate on being SNP deputy leader - despite previously anticipating that he'd do both jobs. The resignation of communities secretary, Angela Constance, completes a trio of cabinet departures. This reshuffle comes on the same day the government shelved the Education Bill that was to be the centrepiece of this year's law-making programme. That announcement came from John Swinney, who remains as education secretary and deputy first minister. Ms Sturgeon said Keith Brown had left his role as business secretary to focus on putting the SNP on a "campaign footing" after winning the party's deputy leadership earlier this month. Mr Brown previously told the Sunday Post that being deputy leader would not affect his ability to serve in the cabinet. He now says he wants to "give his all" to the deputy leadership, and will be focusing on building towards the next Holyrood and Westminster elections and a possible independence referendum. The new ministers will need to be approved by a vote of parliament, which is expected to take place on Thursday after the junior ministerial team has been announced. A number of MSPs first elected in 2016 are expected to join the government at that point. What does Ms Sturgeon say? The first minster said: "The new cabinet I am announcing today brings fresh talent to the Scottish government and ensures that we are fully equipped to meet the challenges and opportunities facing the country in the months and years ahead. "With the impact of Brexit on our economy and wider society, it is right that the issues it presents are fully reflected at cabinet level, while the delivery of a new Scottish social security system also requires a voice at the cabinet table. "Those appointments, together with the reshaped portfolios announced today, mean that people can have confidence that the Scottish government will continue to deliver for people, public services and communities the length and breadth of the country." Scottish Conservative deputy leader Jackson Carlaw said the refresh was "a long time coming", but said the government's "time is up". He said: "There may well have been a few ministerial changes. But this is an SNP government that is tired, completely out of ideas and all over the place on key issues." Scottish Labour MSP Rhoda Grant said the government "has been out of touch and out of ideas for too long". She said: "This reshuffle is long overdue but the real change Scotland wants and needs won't come from changing the odd cabinet secretary - it will come from changing the government." The Scottish Greens urged "bolder action" from the government following the reshuffle. Co-convener Patrick Harvie said: "We face serious threats from Brexit and the climate crisis but also opportunities to tackle inequality, create a fairer economy, and improve the education and transport people rely on every day." Scottish Lib Dem leader Willie Rennie said the SNP "has nothing left to say". He added: "They're reduced to tantrums at Westminster and panic at Holyrood. The SNP's record is haunting them, they have lost direction and are now thrashing around for a solution."